Got brown sugar, cinnamon, soy sauce and thyme? You probably have most of the ingredients you need to make this delicious Caribbean Jerk Chicken Kabobs. Mix first 7 ingredients until well blended; pour over chicken in large bowl. Stir to evenly coat chicken. Refrigerate 30 min. to marinate. Heat grill to medium-high heat. Remove chicken from marinade; discard marinade. 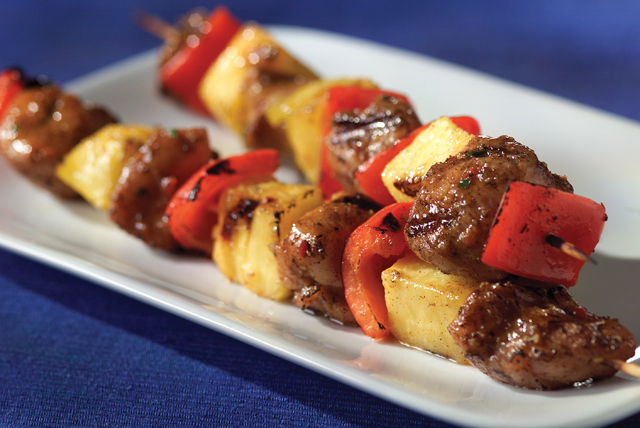 Thread chicken onto 12 skewers alternately with bell peppers and pineapple. Grill 15 min. or until chicken is done, turning frequently. Spray the unheated grate of the grill, away from the fire, with cooking spray before using to prevent sticking. Or, brush the grill grate with oil. Substitute 1 can (20 oz.) pineapple chunks, drained, for the fresh pineapple chunks and/or a green pepper for the red bell pepper.